Notice all the damage, and worn areas. "This home was a rental for a number of years, and it shows in certain areas. 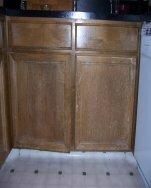 The cabinets really showed the neglect and abuse that had occured over the years, but with Lynn's quick work, they look really great! Thanks Lynn!" Check out our refinished cabinets. 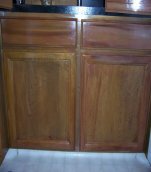 "Mr. Seely fixed my old kitchen cabinets to look new again! He was able to repair my kitchen drawers. saw marks on the tops of them. He has a real talent for creating a natural wood look. like wood to cover up the old worn out wood. colors to the ones that needed repair. He also worked in a very timely manner." to learn about the preparations steps and fillers we use.